To watch ballroom dancers perform an intricate step like the tango is to contemplate the human body as it solves a complex physical equation. But there is more than quick-witted footwork, subtle sleights of hand and finely executed head movements at work. Watching ballroom dancing is, at its heart, bearing witness to the tangible chemistry between two people, a fusion of two into one, a graceful and often-intimate mixture of energy and beauty. It is, friends and dance fans say, what it is like to watch Bill and Ronda Armstrong. 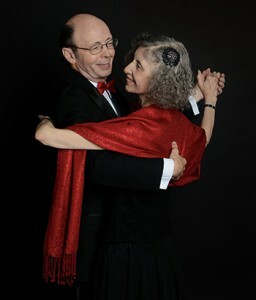 The two, married since 1981, have danced together since 1993. They are akin to the elder statesmen of ballroom dancing in Iowa, emissaries for its continued relevance as well as its elegance. 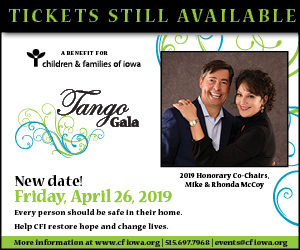 In 2003 the couple began devoting extra hours to organizations that support ballroom dancing, including the Castle Club, Dance Club 76 and the Red Friars Dance Club. They are steadfast in volunteering to promote dance, working, for example, for a year and a half to help plan the Castle Club’s recent 100th anniversary gala. The summer before her senior year at Valley High School, Micah Garton trained with the renowned Bolshoi Ballet, living on her own for six weeks in Russia. She’d also traveled to the Caribbean, Japan and Germany with her parents. But none of this prepared her for Uganda. Talk about inspiring: When the six-credit seminar ended and the students returned to Des Moines, most—about 20—continued meeting with their professors, despite already full schedules. Calling themselves Partner Uganda, the students spent last school year planning and raising money for a desperately needed medical clinic in rural Uganda. Their efforts are paying off. When a new group of Drake students visited Uganda this past summer, they grabbed shovels for the clinic’s groundbreaking ceremony. “This clinic will literally save lives,” says Scott Raecker, executive director of the Drake-affiliated Character Counts in Iowa. His daughter, Emily, was part of the 2012 group. “It really is an amazing thing to see what these young people are doing,” he says. The building, the first of four planned phases in a complex, should be completed soon. A midwife, registered nurse and administrator will serve an anticipated 50 to 100 patients daily. The clinic will operate independently from the government, with a board of directors (including a Drake professor). When the clinic becomes self-supporting in about three years, Partner Uganda will implement other phases of the project. The clinic is located near Senteza’s boyhood home, in the village of Kikandwa, about 25 miles northeast of Kampala, Uganda’s capital. Although the area is rural, students were astounded to learn that an estimated 100,000 people live there—without health care. Cholera and malaria are real threats. Diarrhea can turn fatal. “You get a cut and an infection, you might lose a hand,” says Raecker, a key supporter of the project. Villagers must walk 10 to 12 miles to the nearest hospital, Garton says. “One elder I was talking to said only half the people make it,” she says. The students who visited Uganda’s biggest and best-known hospital were appalled at the dirty, cluttered conditions and that patients’ families must provide linens, food and care for their loved ones. In 2012, students surveyed residents about their needs. Based on the survey, plans for the clinic ballooned, along with the budget, which grew from $14,000 to $136,000. Partner Uganda so far has raised about $43,600 for the clinic (it has other projects, too) from family and friends, by speaking to community organizations and churches, and from a wine and cheese event at Drake last spring. The group also received matching grants from an anonymous donor and the Urbandale-based nonprofit Shining City Foundation (SCF). Developing relationships—and tapping supporters’ expertise—has been critical to the students’ success. Years before his daughter went to Uganda, for example, Raecker co-founded SCF. It supports sustainable projects around the world, including bringing medical and dental care to rural China. SCF manages Partner Uganda’s donations, guaranteeing that 100 percent of contributions go directly to projects. Raecker also has worked on global projects as international services director for the Rotary Club of Des Moines A.M., which also joined Partner Uganda. In Africa, the Rotary Club of Kampala South acts as the group’s fiscal agent, and that club’s clinic team includes lawyers and the architect who designed the building. Other partners include a church and health organizations in Uganda. “Working from this far away, you need people you can rely on,” Senteza says. Drake University has also played an indispensible role. Students are required to take classes that promote engaged citizenship, global understanding and—since last fall— experiential learning, all key components of the Uganda seminar. The university also has demonstrated innovation and flexibility. For example, when students in the summer of 2012 group said they wanted to continue developing plans for the clinic, Senteza was able to quickly create a weekly one-credit “trial course” that fall. At that point, many decisions still needed to be made, such as the size of the clinic, how it would be built and its budget. Some students had scheduling conflicts with the class, but they participated on their own without receiving school credit. The other Drake faculty members involved—Debra Bishop, Glenn McKnight, Tom Root and Natalie Adkins—are exceptionally accomplished and committed, Senteza says. “I feel lucky to work with the people I do,” he says. Some might question why the Drake students are sending money to Africa when some of Des Moines’ most impoverished neighborhoods aren’t far from campus, Raecker says. But providing aid for one doesn’t preclude helping the other, he says, and can even inspire increased local efforts. At the same time, it’s virtually impossible for Iowans to imagine the level of need in Uganda, he says. In Des Moines, a homeless pregnant woman usually can access free health care, he says, while a Kikandwa woman receives no prenatal care and typically gives birth on a dirt floor or beside a stream. More than 62 out of 1,000 babies born in Uganda die before their first birthday, compared with almost 6 per 1,000 in the United States, according to 2013 estimates by the CIA World Factbook.